Tis’ the season for spending time with friends and family and celebrating the holidays. Certainly, Christmas may be celebrated differently all over the world but it is safe to say we can all agree the season is all about surrounding yourself with the ones you love the most. Although this time of year can be very difficult for those who study or intern abroad and have to be away from friends and family. Spending the holidays in a foreign country presents many unique opportunities to interns and trainees. After all, who knows when you will ever get to spend Christmas, Hanukah, Thanksgiving, Boxing Day, or New Years in a different culture ever again! But no matter where you are from and what holiday you celebrate in your home country, interning abroad is a great way for a student or intern to partake in many new celebrations, in addition to having the chance to share pieces of their own culture and holiday traditions from back home. 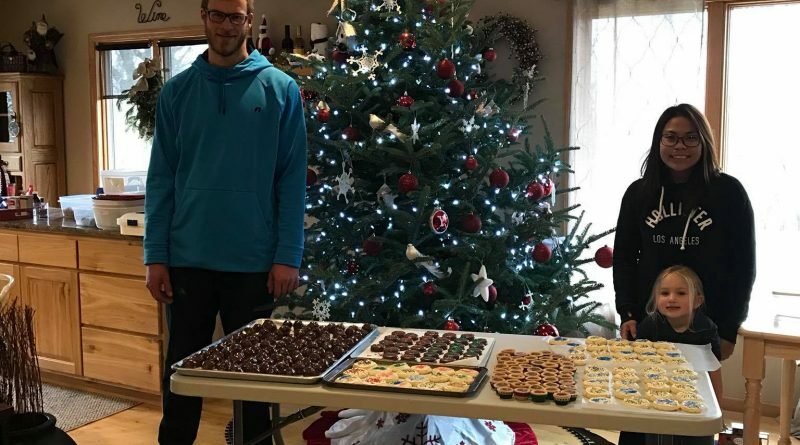 CAEP agriculture trainee Allysa Reyes shares a little with us about her traditional holiday baking experience she participated in with her host family and fellow trainees. Christmas cookies might be baked all over the globe but this old tradition was extra special this year as Allysa, her fellow CAEP trainees and host family celebrated new friendships and cultures all while baking some yummy Christmas treats. “At first, I thought that I wasn’t going to enjoy baking because I am not that into baking. But I was wrong, it was totally fun. I loved the decorating part because it brought out my creative side. Looking at the finished product was so satisfying. I also got to learn new and easy to make recipes shared by my host Sherri and her daughter Heather. I am definitely going to bring these recipes back home with me to share! I am thankful that I tried and experienced this tradition with them. I am from the Philippines and the Christmas celebrations start as early as September. The Filipinos are known to celebrate the longest yuletide season in the world. Some traditions that we practice every year are Misa de Gallo or Simbang Gabi which is a series of dawn masses from December 16-24 and starts as early as 3:00 AM. This Christmas practice shows how Filipinos value their faith. We also go caroling throughout the season. You will know that Christmas day is near when a group of kids as well as adults come to your house and start singing Christmas carols. They will go from house to house and after singing, these carolers expect a handful of coins from homeowners. They also use handmade musical instruments like tambourines made out of aluminum bottle caps and drums made from empty milk cans. Aguinaldo is a common tradition of ours where kids visit their relatives and godparents to collect their gifts. Many Filipinos also celebrate in the streets which is one of the most entertaining and fun-filled Christmas traditions in the Philippines. We usually don’t bake cookies during Christmas, but instead, we have these traditional delicacies that are made during Christmas. These delicacies are “putobumbong” (a purple, sticky rice delicacy steamed in a bamboo tubes, buttered then sprinkled with brown sugar and grated coconut meat) and “bibingka” (an egg based-cake cooked using charcoal burners). My hosts Mike, Sherri and the rest of the Yager family (Road View Dairy Farm) are very awesome and wonderful hosts. They provide what we need and make sure that we are comfortable and enjoy our everyday stay in the U.S. We always learn something new from them and they are all nice and easy to talk to.